I am thrilled to announce that a review of Sand & Sutures, Texas Authors 2017 Medical Fiction book of the year, has been featured in the March/April edition of We Art Magazine. Excited to see this! The Space Needle is a huge tourist attraction and a well-known icon in the city of Seattle. But for me, it symbolizes the Northwest and every memory associated with it. The distinctive structure is one of the landmarks that stands out when flying into the city, especially at night. The nighttime lights of the Space Needle are absolutely awe-inspiring, and they change to reflect various events. When the Seahawks play, the tower illuminates in blue and green. During the holidays, a tree made of 1,200 lights is perched 560 feet atop the building, brightening the city. Every New Year’s Eve, the Space Needle hosts a fireworks display synchronized to music. When the University of Washington Huskies won the Rose Bowl, the team’s logo was temporarily painted on the tower, and the building glowed with a purple hue. The Legacy Light, or Skybeam, is a vertical beam that shines on special occasions. Every year on 9–11, it lights up the sky for eleven consecutive hours. The observation deck of the Space Needle provides a spectacular 360-degree view of the city and surrounding area. To the west, you’ll find Puget Sound and the Olympic Mountains. To the east, you’ll see the snow-capped Cascade Mountains and Lake Washington. You can get to the top by either taking the 41-second elevator ride or climbing the tower’s 848 steps. The Space Needle is one of my favorite locations, not because of the building itself, but because of what it represents for my characters throughout the Scrubs series. In Scrubs, my leading man associates the Space Needle with home. He even has a tee-shirt with the word SEATTLE printed on the front; one of the T’s is a silhouette of the famous building. The structure brings back childhood memories for him and is one of the first things he shows people when they visit his beloved city. For most, the Space Needle is just a steel structure in the middle of downtown Seattle. But for me, the Space Needle symbolizes much more — hiking through moss-covered forests, the snow-covered Cascade Mountains, fishing in crystal clear lakes, waterfalls, fresh seafood, and my love for city of Seattle. I grew up in the Pacific Northwest, and although I no longer live in Seattle, I will always consider the emerald city my home. Happy New Year, everyone! Now that my latest book is finished and in the hands of my designer, I am hosting an Amazon Giveaway for Scrubs (Kindle Edition), the first book in my series. Click the link below for your chance to win. No Purchase Necessary. Good luck! ​I’m so excited because my book, Center Stage, was just nominated for the 2017 Reader’s Choice Awards! Please vote for it at www.tckpublishing.com/readers-choice-voting. Look for it under General Fiction. Thank you all for your continued support. 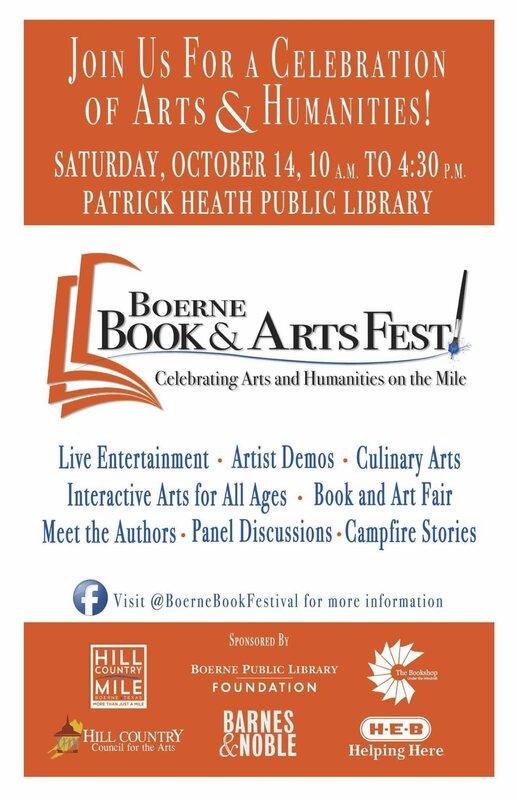 I will be at the Boerne Book and Arts Festival on Saturday, October 14. If you’re in the area, stop on by for a celebration of the arts. I am currently seeking readers who are interested in receiving a free PDF of any of the books in the Scrubs series with the understanding that when you finish reading it, you post a review on Amazon/ Goodreads/ Barnes and Noble. More information about each book is included on my website. If interested, please let me know. This weekend, I had the wonderful privilege of being a part of the Wimberley Book Festival. These festivals are beneficial for many reasons. First and foremost, they give me the opportunity to mingle and network with other writers. 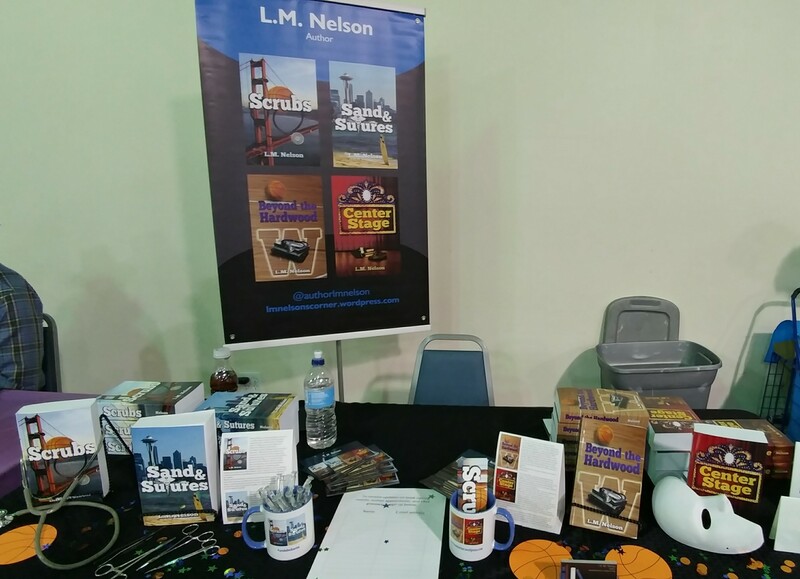 I meet interesting people, find out about writing opportunities, and sell a few books in the process. I woke up at the crack of dawn and drove for an hour and half to the Wimberley Community Center. 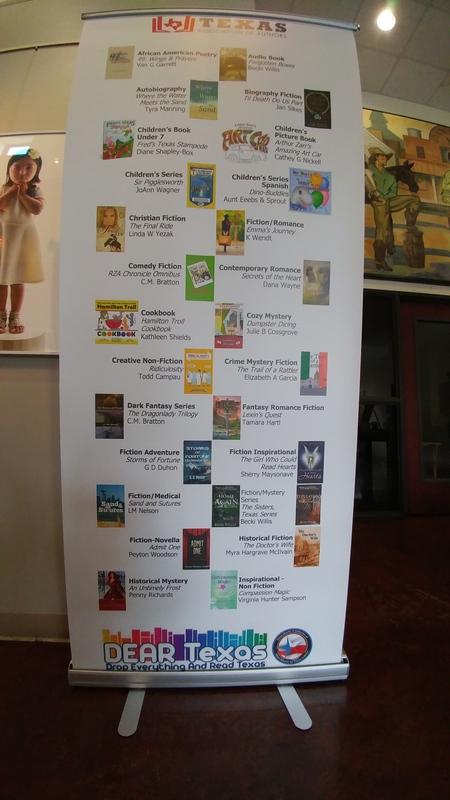 I was pleasantly surprised to walk in the door and find my book, Sand & Sutures, listed on a banner among other award winning authors. This was a positive boost to my day. 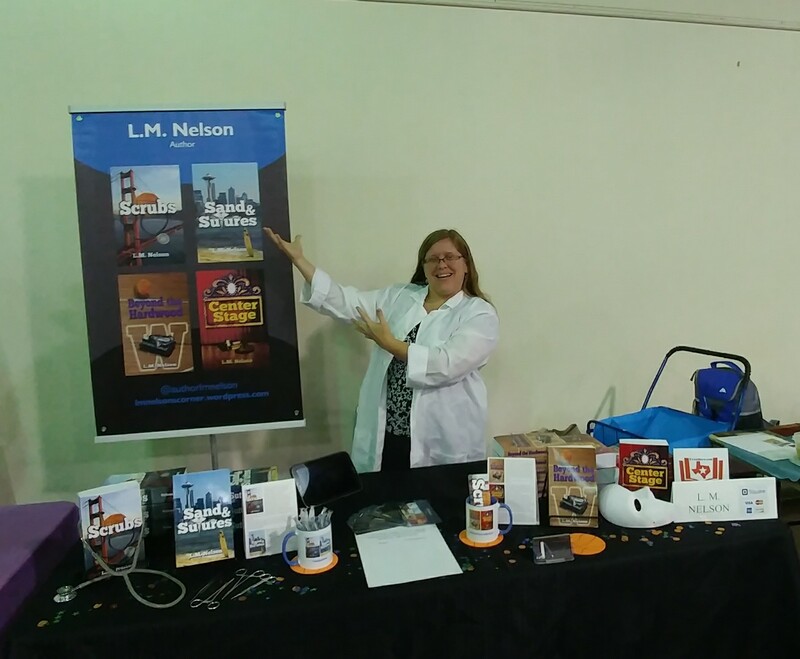 Once I unloaded everything from the car, I began to set up my table, which included my own banner, several promotional items and props, and of course several copies of my books. Authors from all over the state of Texas who write in every genre under the sun had their booths set up throughout the room. Influxes of crowds came in at varying intervals and explored each table. They took business cards, discussed books, and filled their bags with giveaways. Throughout the day, I had the opportunity to reconnect with authors I hadn’t seen in awhile. I also made a little video blurb about my books, spoke with quite a few potential readers who stopped by my table to say hello, gave away a mug full of syringe pens, and sold a few books. Overall, I’d say the day was successful, and I look forward to attending this event again next year. I will be signing books and talking about the Scrubs series at the Wimberley Book Festival June 10th. If you stop by, you can also get a sneak peek into the new project I’m working on. I am flattered to have been recently recognized on Opus Book Review’s Facebook page. We are such a fan of author L.M. Nelson and her book series titled “Scrubs”. 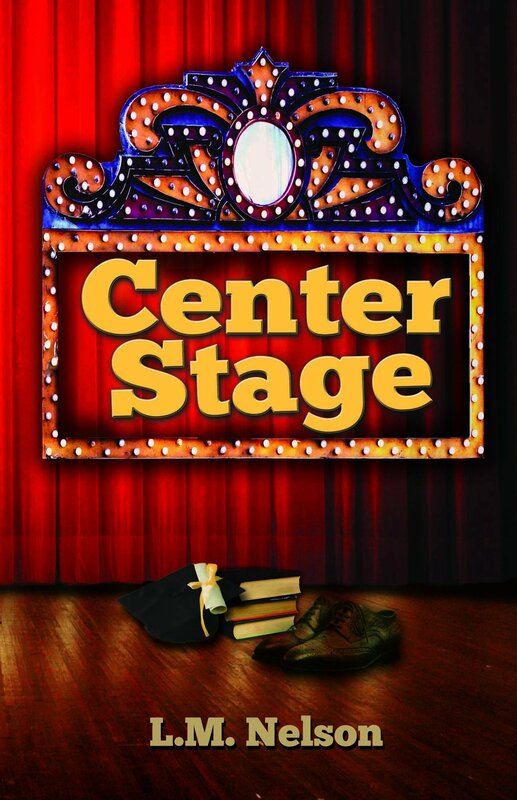 Thought we might share the outstanding cover art of her 4th book in the series, Center Stage, because it is outstanding, right? We are also very excited to hear about a new project she is working on and look forward to sharing it with you! As a matter of fact, why not share ALL of the fantastic new cover art for all of the books in author L.M. Nelson’s Scrubs series? We love her and think you will, too. Take a little time to get to know a little bit more about her and her work by checking out her website, https://lmnelsonscorner.wordpress.com/. 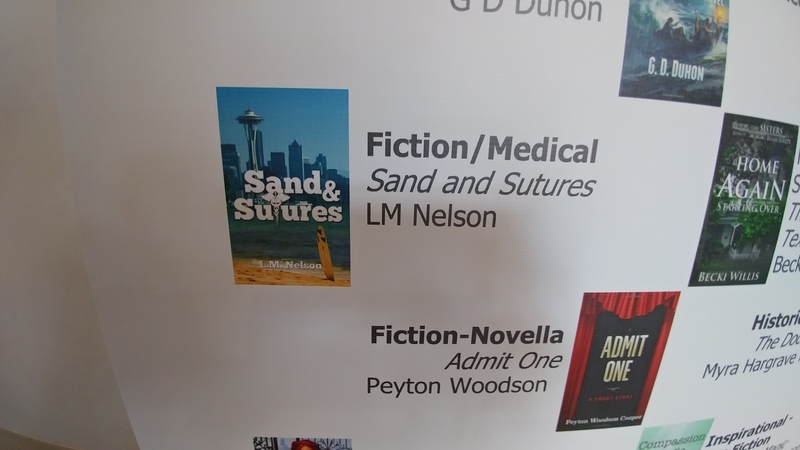 The second book in the Scrubs series, Sand & Sutures and the one that I have had the great opportunity to read and review, was recently voted 2017 Texas Authors Best Medical Fiction book of the year and well deserved! If you have a few minutes, take a look at our review of Sand & Sutures on our website, https://opusbookreview.wixsite.com/opus. We are looking forward to reading and reviewing all the books in L.M. Nelson’s book series, Scrubs! Opus has also added a new Featured Indie Author series and L.M. Nelson has so graciously agreed to be our first Indie Author feature, so please keep a look out for that as well. I hope everyone is having a GREAT Saturday! Here it is. The long awaited cover reveal for Center Stage, the fourth and final book in the Scrubs series. New York City—a thriving metropolis full of dreams. The bright lights of Times Square, the billboard posters promoting the latest musicals, and the theatre marquees up and down Broadway attract millions of theatre lovers every year. Lauren Hanson was no exception. Prior to moving to New York, Lauren made every effort to make her dream of performing on Broadway a reality. She enrolled in dance classes, took voice lessons, and participated in various acting workshops. Now in her first year at the Juilliard School, she seeks to improve her craft and work her way into the professional world of musical theatre. A Broadway performer named Roger Zellers steers her in the right direction. His assistance becomes tainted, however, when a blast from his past tries to sabotage Lauren’s career. Harassment, lies, and openly violent threats make Lauren question Roger’s intentions. While Lauren pursues the glamor of the Great White Way, Lauren’s twin sister tries to establish herself as a reputable choreographer. Having connections with Roger comes in handy when he asks her for a special favor. Through Roger, she meets other professionals, gains a new following, and finds potential love. But will her fairytale come true, or will her plans crumble to pieces in the hustle and bustle of New York City?